Good thing we always have bihon and sotanghon in stock. I let him choose which noodle he prefers and he chose bihon. So bihon guisado it is. Bihon guisado is one of those dishes that are always present as part of a Pinoy's handa (party menu) It is always present in most occasions. And since Christmas is fast approaching you can add this in your menu for noche buena or may be for that get-together you've been planning with your friends or families. With my bihon guisado, I made use of left-over lechong kawali and lechong manok. If you don't have these, you can use pork and/or chicken as you wish. As you can see, the cabbage I used is the purple kind. Well, you can use any kind of cabbage whichever is available. The green ones are cheaper of course so go for that. You can also make use of the pechay Baguio or wombok as we call it in our household. 1. 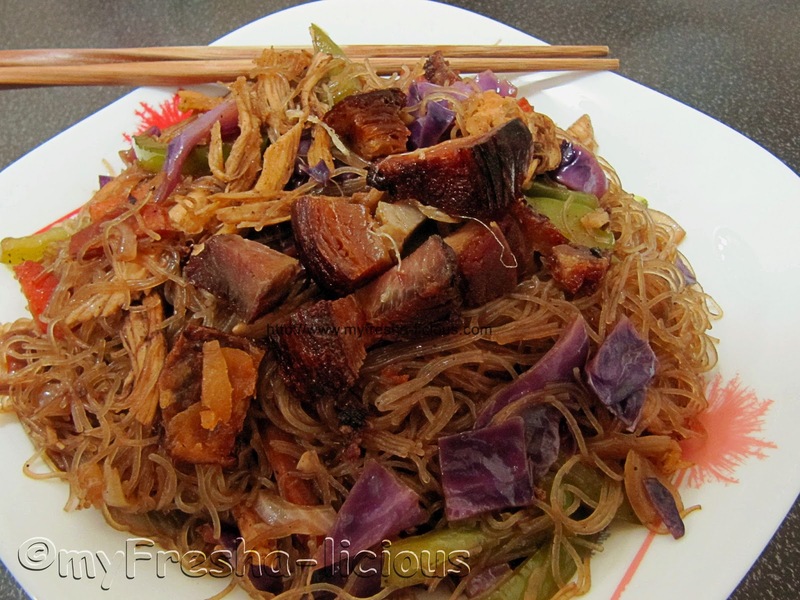 Read instruction of the bihon noodles you will be using and follow the cooking directions. For the brand I used, the instruction said to rinse the noodles in water and so I did. I rinse it in water after I finished preparing half of the ingredients. 3. Saute the garlic until aromatic, then add the onion and half of the green onions. Stir fry until it becomes almost translucent. 5. Pour the water on the veggies along with the soy sauce, fish sauce, and sugar. Let it simmer until the vegetables soften. Remove the vegetables and chicken from the pan and set aside. 6. Add in the bihon noodles stirring continuously to loosen the noodles. Add more water as needed. Adjust taste by adding fish sauce as needed. 7. Once the noodles are cooked through, turn of the fire and stir in the cooked veggies and chicken. When serving, arrange the noodles on a serving dish then top it with the fried lechong kawali. Serve with lime and and chopped green onion leaves on the sides.